Korea films and dramas are enjoying great popularity all over the world. The high rankings of the videos in America have drawn the public attention. On 18th, 'VIKI RANKINGS ALL TIME' , a United States global site has revealed the top 10 of the Korea drama and movies that the Idol Stars starred in. The most popular drama is MBC drama 'Playful Kiss' starred by Kim Hyun Joong since people watch it from YouTube. The drama has attracted a lot of viewers and the fact that it has already been made into a movie and has become even more appealing to the overseas netizens and they are requesting the production of season 2 of the drama. The second place goes to the parody of 'Flowers Over Boys' by the popular group,Big Bang . In 2008, when they were holding their national concert, they introduced 'Flowers Over Big Bang' which was adapted from the well-received comics, 'Flowers Over Boys'. 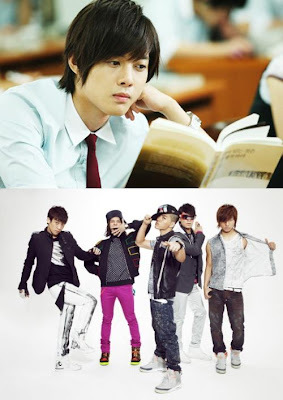 Big Bang members took up the roles of the flower boys group 'F4'. T.O.P. acted as Tsukasa and he always had the powerful friends around him, namely Rui (G-Dragon), Sojirou and Akira (Seungri and Taeyang) and Tsukushi (the role of herorine which was taken up by Daesung). 'Secret Big Bang' was broadcasted in SBS 'Big Bang Show' this year. It also ranks 5th in the chart which shows that they are very popular all over the world. 'Secret Big Bang' is a parody of the hit drama, 'Secret Garden' and in their parody, G-Dragon took up the role of Jiraim, T.O.P. was Kimjootop, Taeyang was Taetimjang, Daesung was Kang Secretary and Seungri was Seungska. Moreover, the 1st reality show of f(x), 'Koala', gains the 8th place and Shinee 's live music show, ' The Muzit' ranked 15th. In the meantime, the dramas, animations, music videos and news from all over the world are available in 130 languages which serve an average of 4 million viewers/readers per month. For famous sites, the page views and the cumulative views of the vidos can reach as high as 1 billion and 10 billion respectively.